When I was still in Japan, I researched coffee shops in Montréal and Le Couteau seem to be floating at the top of the list of many people, so I took my jet lagged self to this café located on rue St-Denis, not too far North from rue Mont-Royal. The simple black and white awning represents a knife, hence the name of the place: Café Le Couteau or for my non French speaking friends Café The Knife. When I got there, the place was almost full of people playing on their MacBook pro and drinking coffee. The first thing I noticed was the single halogen burner with a Japanese made Hario siphon coffee maker standing next to the cash register. This struck a very familiar chord with me since siphon is pretty popular in Japan. The second thing I noticed was the Mirage Triplette which is a very serious expresso machine. The coffee shop decoration is very minimalist, airy and classy. Forget the old Japanese coffee shop, this is a very modern space which keeps the best features of the old building it occupies. I ordered a Colombia El Diviso which is roasted by 49th Parallel in Vancouver. Forget local sourcing or even in house roasting. It’s good stuff and I am happy to try this roaster. The staff at Le Couteau was very friendly and my coffee was made under the supervision of the owner. Siphon coffee in Japan is never prepared with a scientific termometer, but the attention to details at Le Couteau showed a great respect to proper coffee preparation. My coffee was served in a nice little carafe and the taste was pretty good, medium roast with a good acidity. 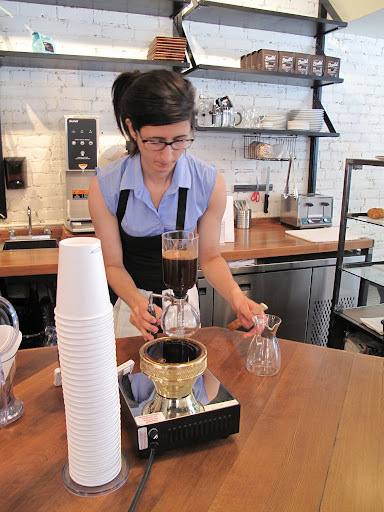 The siphon brew gives a clean and simple taste. 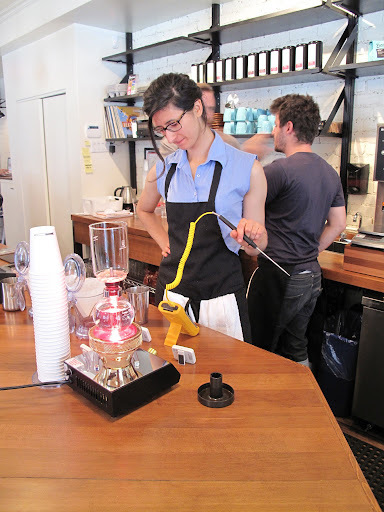 I didn’t try any other brewing method at Le Couteau, so all I can say was that they did a good job with the siphon. I remember leaving Montréal 4 years ago before the whole coffee revolution, I learned a lot about coffee in Japan and I can see that they are going in the right direction. Café Le Couteau is definitely a place I would hang around. If you have never been to Japan and you want to try a siphon, you will really get a kick out of Le Couteau. Thanks ! An address I will write down for my next visit to Montreal. Coffee is a daily must ! Can’t hardly wait until next December to enjoy a warm brewed on the spot cup ! It’s great to be sitting here at le couteau, mesmerized by the siphon preparation!